- God created a paradise for mankind so no radioactivity would have existed on the original Earth because radioactive decay can cause birth defects, disease, and death with lowered lifespans. - The fourth state of matter, beyond solid, liquid, and gas, is plasma (lightning, neon lights, etc.) which is like a gas but with the electrons stripped away. - By the piezoelectric effect, pressure on quartz produces an electric voltage and the granite in the Earth's crust is more than one-fourth quartz. - Z-pinched electrical pulses produce nuclear combustion producing heavier elements by stripping away electrons and then squeezing together nuclei. - Atmospheric lightning produces new isotopes (most of which decay within minutes). 2016 Update: Video of earthquake lights surface, this time after New Zealand's magnitude 7.8 quake epicentered between Christchurch and Wellington. 2014 Update: A paper in the journal Seismological Research Letters is reported on in USA Today's Scientists find records of rare 'earthquake lights'. 2013 Update: This may be the phenomena causing the apparent pre-quake disturbances in the ionosphere that led scientists to consider a possible earthquake warning system, as reported in 2008 by BBC News, and pursued by the U.K. and Russia in 2011 and generating continued interest and research in 2013 in a European Geophysical Union conference presentation, and here with RSR's 2014 interview with QuakeFinder. - The journal Nature reports that an average earthquake produces hundreds of millions of volts. - During the upheaval of the global flood pressure in the crust produced enormous voltages that produced plasma surges in the crust. - Those voltages smashed together the nuclei of atoms to create, in the crust, radioactive elements and massive, instantaneous apparent radioactive decay. - Missing uniform distribution of earth's radioactivity: From our RSR debate with theoretical physicist (emphasis on the theoretical), Lawrence Krauss... The theory of chemical evolution claims that all of our radioactive elements were created in the explosion of stars, but that would predict a relatively uniform distribution on Earth, at least throughout the crust, and possibly the mantle too. However, in an otherwise contentious interview, Krauss agreed with Enyart's statement on air that 90% of Earth's radioactivity (uranium, thorium, etc.) is located in the continental crust, and Krauss added, a mystery for him, that it tends to concentrate around granite! That is, that 90% is not in the mantle nor in the enormous amount of the crust which lies under the oceans, but our planet's radioactivity is concentrated in 1/3rd of 1% of the Earth's mass, in the continental crust. (Further, the release of it's heat has not yet reached a steady state.) Krauss offered a partial explanation: that uranium was originally evenly distributed throughout (an alleged) molten earth but being a large atom, it floated toward the surface. This the bias of this physicist led him to forget, apparently, that it is density, and not size, that causes things to float. Even denser than gold, uranium is one of the most dense elements (excluding atheists and other manmade phenomena). Further, for argument's sake, that would only explain the relative absence of radioactivity deep in the Earth, but would not explain uranium's distancing itself from the mantle and from the oceanic crust, nor its affinity for the continents and even, of all things, for granite. Further, under Krauss' belief in the widespread falsehood that the planet was once molten, if so, then the gold in the crust should have sunk to the core! The creationists, on the other hand, have a theory based on observational science as to why radioactivity is concentrated around granite. The isotopes of each chemical element have almost constant ratios with each other. ... Why is the ratio of 235U to 238U in uranium ore deposits so constant almost everywhere on Earth? One very precise study showed that the ratio is 0.0072842, with a standard deviation of only 0.000017. [There's less than one U235 atom for every hundred U238s.] Obviously, the more time that elapses between the formation of the various isotopes (such as 235U and 238U) and the farther they are transported to their current resting places, the more varied those ratios should be. The belief that these isotopes formed in a supernova explosion millions of light-years away and billions of years before the Earth formed and somehow collected in small ore bodies in a fixed ratio is absurd. Powerful explosions would have separated the lighter isotopes from the heavier isotopes. Some radioisotopes simultaneously produce two or more daughters. When that happens, the daughters have very precise ratios to each other, called branching ratios or branching fractions. Uranium isotopes are an example, because they are daughter products of some even heavier element. 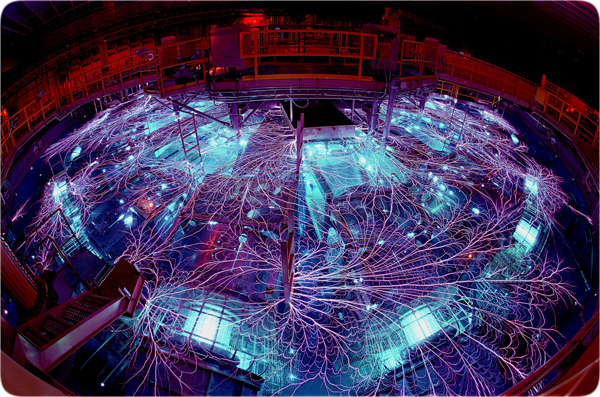 Recall that the Proton-21 Laboratory has produced superheavy elements that instantly decayed. Also, the global flux of neutrons during the flood provided nuclei with enough neutrons to reach their maximum stability. Therefore, isotope ratios for a given element are fixed. Had the flux of neutrons originated in outer space, we would not see these constant ratios worldwide. Because these neutrons originated at many specific points in the globe-encircling crust, these fixed ratios are global. - Waltbrownium, the IUPAC, and the Nobel Prize in Physics: The element that decayed into daughter products U-235 and U-238 is the naturally occurring though now-extinct waltbrownium. Symbol Wb. Atomic number (Z) 184. Atomic weight of > 473.07. 184 protons. > 289 neutrons. Solid at Earth's crustal temperatures and pressures. Half-life perhaps ~10 ns. Waltbrownium is the heaviest chemical element detected by man and therefore atop the post-Actinoid series. Wb is not [yet] an IUPAC officially named element but has been preliminarily named, here, by RSR. The identification of this element should earn its discoverer a Nobel Prize in Physics after he identified the evidence for its existence and the experimental evidence for its formation. The nearly constant uranium ratio in deposits worldwide provide the evidence to confirm that waltbrownium existed on the Earth. (This evidence provides as much, or even more, confirmation as neutrinos provide for solar fusion.) Further, the thousands of Proton-21 Laboratory experiments in the Ukraine (and in the U.S. and Germany) provide the experimental evidence for Wb formation. This element was predicted in January 2012 when Brown, Ph.D. from MIT in mechanical engineering, published the two paragraphs immediately above. - Non-HPT flood models have a "heat problem" including because their accelerated decay explanation of Earth's radioactive elements would melt much of the Earth if it had actually happened as they envision. Regarding Catastrophic Plate Tectonics, for example, see RSR's Global Flood video just below, beginning at 25:29 in. The HPT on the other hand explains the origin of Earth's crustal radioactive materials in a way that removes heat! Wikipedia's nuclear binding energy article accurately explains: "For elements that weigh more than iron (a nucleus with 26 protons), the fusion process no longer releases energy. In even heavier nuclei energy is consumed, not released, by combining similar sized nuclei." - Carbon 14 Dating Subject to Less Havoc: From rsr.org/14c: "Dr. Brown's theory for the origin of Earth's crustal radioactivity intrinsically explains the unreliability of heavy element radiometric dating of Earth rocks while recognizing Carbon 14 dating as relatively accurate (adjusting for the old earthers' erroneous assumption that 14c levels have been constant over the past 100,000 years). In the HPT, what appears to be accelerated radioactive decay applies to elements in the crust and inside the subterranean water chamber (i.e., beneath the firmament). This effect would not have applied to an element in the atmosphere, such as 14c. So as a result of widespread misunderstanding of Earth's history, old-earth geologists contend with infamously contradictory million- and billion-year radiometric dates, whereas carbon dating is not subject to the same extreme physical forces that play havoc with other radiometric dating methods." * Post-show Update: Physics experiments are demonstrating how all elements, including gold and silver, and radioactive elements like uranium and thorium, can be formed in the lab (and in the crust of the Earth as explained by Dr. Walt Brown's Hydropate Theory). Just click and search (ctrl-f) for the word: Kiev, to find the sidebar that begins like this: "Since February 2000, thousands of sophisticated experiments at the Proton-21 Electrodynamics Research Laboratory (Kiev, Ukraine) have demonstrated nuclear combustion by producing traces of all known chemical elements and their stable isotopes..."
Get the Blu-ray or DVD for $24.00 or the HD video download for $19.99. - Walt Brown's Hydroplate Theory on The Origin of Earth's Radioactivity! * Correcting Google, et al: This seems minor but this erroneous simplification is widespread. Google does it too. 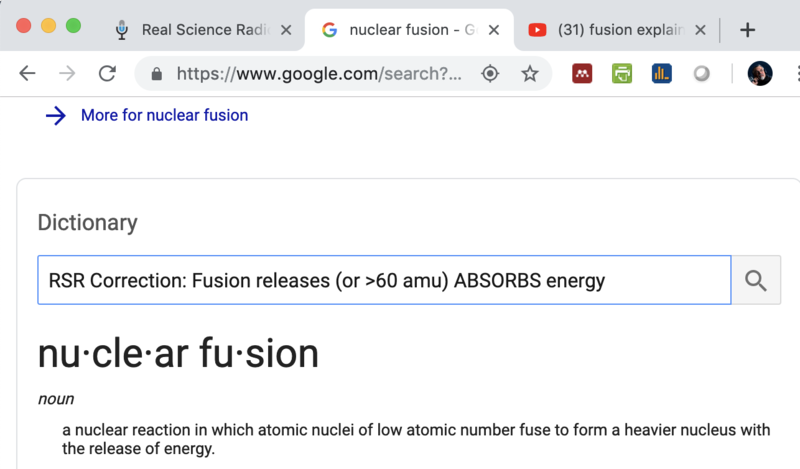 In this screenshot from Googling: nuclear fusion, their info states, "a nuclear reaction in which atomic nuclei of low atomic number fuse to form a heavier nucleus with the release [OR ABSORBTION] of energy." This same error appears frequently including in the the first minute of a Modern Physics video on the YouTube channel High School Science Physics Explained. It's for high school students but still, that doesn't justify the overstatement at the beginning that says nuclear fusion, "is the production of energy by combining two smaller atoms into a larger atom." Nuclear fusion, as they know, also consumes energy for produced nuclei heavier than 60 AMU. By the way, as this mistake is commonly made, this correction can be posted to forums and linked back here via this rsr.org/fusion-erroneous-simplification. Thanks for the great science education. Please allow one correction though. At 7:20 you say that it's thought that heavy elements are made in supernova explosions. Science News explains that "simulations show that these explosions have an insufficient quantity of neutrons" (March 2013, p. 16-17). Previously, the National Academy of Sciences issued a 2003 report titled, Eleven Science Questions for the New Century, they included question #10, “How were the heavy elements from iron to uranium made?” Then the journal Nature reported that actually looking at a supernova explosion provides astronomers "no spectroscopic evidence that r-process [heavy] elements have truly been produced" (Rosswog, 2013, p. 536; see also Physics Reports, 2007; Astronomy & Astrophysics, 2011; and Physical Review Letters, 2013). (Studynova, I'd provide a link to my site where I link directly to all these sources, but I'm afraid I'd get booted for spamming. :) Anyway, the supernova theory has been seen deficient for years now and that has brought in a replacement, the merger of black holes with neutron stars or neutron/neutron star collisions. Of course, those theories also have the problem of the uneven distribution of uranium, thorium, etc., in Earth's crust and mantel, with radioactivity located primarily in the continental crust (as Lawrence Krauss admitted to me in an otherwise contentious interview), and that, preferentially near granite. There are also the various unexpected isotope inconsistencies between the sun, moon, earth, etc. See more at rsr.org/bb#supernova. By the way, as this mistake is commonly made, this correction can be posted to forums and linked back here via this rsr.org/supernova-heavy-elements-error. Today’s Resource: You can enjoy the 6-disc standard audio CD set The Hydroplate Theory & Dr. Walt Brown on the Air or get the entire set on a single MP3 CD, both of which contain eleven radio programs. Bob Enyart also highly recommends Dr. Walt Brown's fabulous book, In the Beginning! Order by clicking the link, or calling us at 800-8Enyart (800 836-9278)! * The Written Debate with Atheist AronRa and Creationist Bob Enyart: The creation/evolution debate on the British website League of Reason continues with Bob's post in Round Four. Order or donate online or call 303-463-7789 or 1-800-8Enyart. Street Creds: On Sept. 1, 2017 RSR said on air that there was a significant likelihood that the Florence flyby may show that it has "one or two moons". Five days later NASA announced and the science media headlines reported "Asteroid Florence has Two Moons." See more at rsr.org/predictions.